Functional movement and proper dynamics of youth fitness is a passion of mine. My goal is to motivate, encourage, instruct and make programming fun for teens. 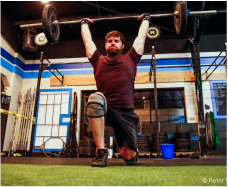 Injury prevention and proper strength techniques are some of the key components. Ever since joining CrossFit over a year ago has completely changed my life and how I look at fitness, nutrition and a healthier lifestyle.